In my previous post I wrote about how we (the ROBIN dev-team) decided to use WebSync for our real-time solution. This time around I want to share how we implemented WebSync in ROBIN. 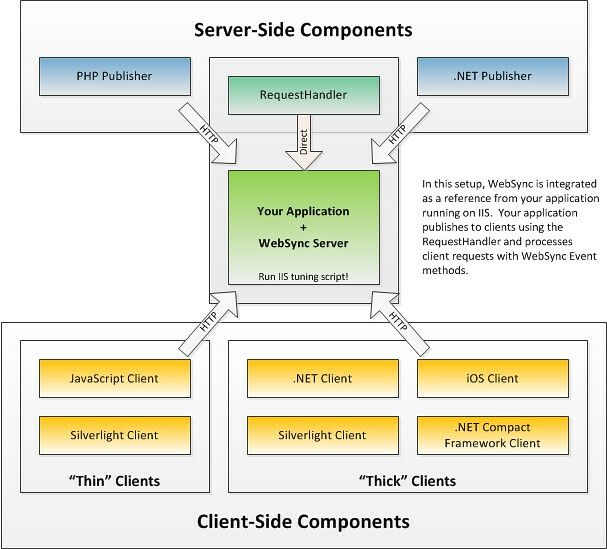 WebSync Server supports multiple application architectures. 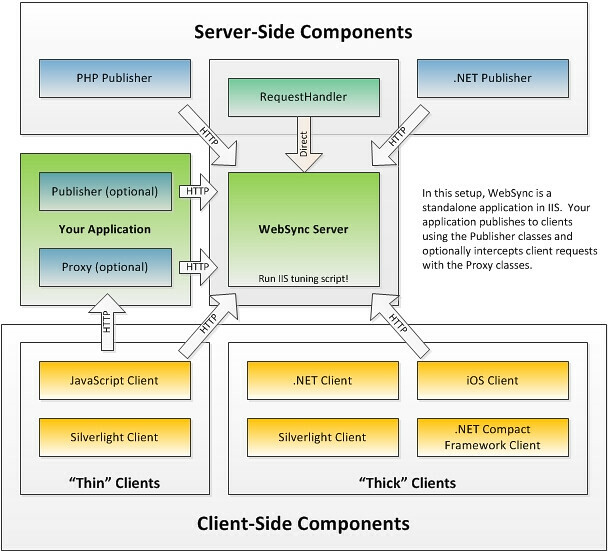 The integrated architecture means that the webapplication and WebSync Server run in the same IIS pool. In Azure this means you can spin up a new instance when the running instance(s) run out of resources. The isolated architecture means that the webapplication and WebSync Server run in separate IIS application pools. At this moment in time we implemented the integrated architecture, but we are debating if we need to go for the isolated architecture, we think it is more robust and gives us the opportunity to decouple the real-time, or notification logic even more. As image 03 shows we use the integrated architecture, realtime is part of our Process Services layer. In our Frontends, API’s and Background Worker layers we leverage Websync to do the real-time handling for us. We use the Stateless Sql Provider, because it is the fastest provider WebSync supports that works on Azure. We already had an on premise working version that used the Sticky SQL Provider, switching seemed the easiest. 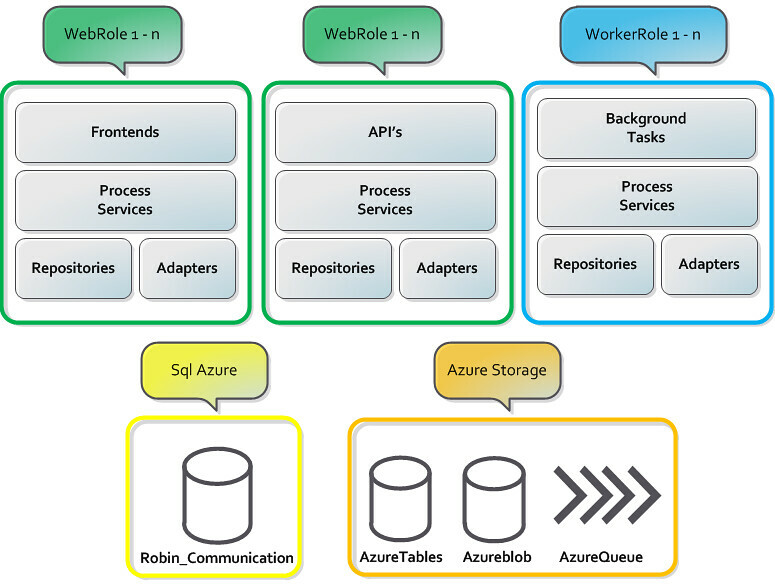 We think switching to the Azure Table Provider will be easy and we will do this if we need it for scalability reasons, we would like to avoid this because we want the best performance possible. The IRequestHandlerWrapper is the interface we use to abstract the Publish method that WebSync uses away. RequestHandlerWrapper implements IRequestHandlerWrapper. Line 14 uses FM.WebSync.Server.RequestHandler and executes the Publish(). Ofcourse, our implementation consists of more, but this, in short, is how we wrap WebSync. We got a RealtimeService (which implements IRealtimeService)and have the notion of 'Publisher', for every frontend (webapplication, device) we have a Publisher implementation, we inject these using Dependency injection. It makes us really flexible. For every new Publisher type we only have to create a new Publisher implementation, or leverage an existing one. As you can see in listing 04 the communicator also uses a jQuery plugin for pub/sub. This plugin makes it possible to use the publish-subscribe pattern throughout our modules and widgets. This plugin uses topics to differentiate between publications. Whenever a real-time message is pushed from the server, a $.publish(…)event for a particular topic is fired and all subscribers to this topic will recieve the message. I made the listings as small as possible, to show the intend. The WebSync client api is clean and self explaining. You have to init, than connect and subscribe. We have lots of advantages from using WebSync, the administration of what clients are connected to which subscriptions is abstracted away for the most part. The way WebSync handles all browsers is a big benefit also, we implemented WebSockets ourselves and had to do all that work manually untill now.